The hot mix asphalt (HMA) dynamic modulus (E*) is a fundamental mechanistic property that defines the strain response of asphalt concrete mixtures as a function of loading rate and temperature. It is one of the HMA primary material inputs for the Pavement ME Design. 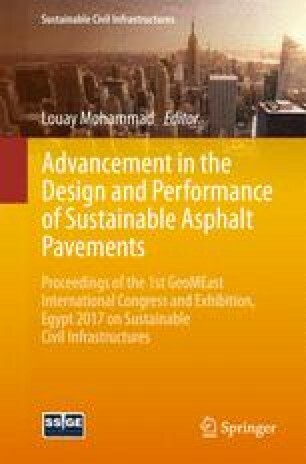 The laboratory testing of dynamic modulus requires expensive advanced testing equipment that is not readily available in the majority of laboratories in the Middle Eastern countries, yet some of these countries are looking for implementing new pavement design methods such as Pavement ME Design. Thus, many research studies have been dedicated to develop predictive models for E*. This paper aims to apply artificial neural networks (ANNs) for E* predictions based on the inputs of the models most widely used today, namely: Witczak NCHRP 1-37A, Witczak NCHRP 1-40D and Hirsch E* predictive models. It also aims at investigating the effect of the different hierarchical binder input levels of the Pavement ME Design on the E* prediction accuracy. A total of 25 mixes from the Kingdom of Saudi Arabia (KSA), and 25 mixes from Idaho state were combined together in one database containing 3720 E* measurements. The database also contains the volumetric properties and aggregate gradations for all mixes as well as the binder complex shear modulus (Gb*), phase angle (δ), and Brookfield viscosity. The results of this study show that using the same input variables of the three models, the ANNs models generally yielded more accurate E* predictions. Finally, there is a strong evidence of the influence of binder input level on the dynamic modulus E* prediction accuracy of both regression and ANNs.